So I asked my friends. I do know for a fact that they make kits - that's the bread and butter of the teachers I know. I don't know any of the national teachers that have an assistant, other than a hubby, kids or simply friends that help. All of my quilts are kitted & cut before they go into a project bin with a sketch of the quilt & print outs of the blocks. That way when I'm ready to work on something, it's ready to go and it makes it easy to grab things in those short snatches of time. I die cut about 95% of my projects. It's like a little assembly line, there are always projects in various stages of completion. I also have stunt piecers, so the kitting comes in handy if I need to send them off to be pieced - it just depends on whether it's personally important for me to piece it myself or whether it just needs to get done. For example, if I have a quilt in 3 colorways, I don't personally need to make the same quilt 3 times. I pick my favorite and send the others out." Jamie Fingal uses a bakery rack with baking sheets to sort projects. Linda Pearl said "In my space, they(projects) multiply like rabbits. I have them organized in clear plastic bags (the kind that you get with new sheets or curtains) and all at eye level when I open my closet door. I've tried keeping the bags in a rolling cart before - and the old addage 'out of sight, out of mind' comes into play." Beth Ferrier said "I am well and truly addicted to Art Bins. I have dozens of them. I have dedicated ones for each of the workshops I teach. 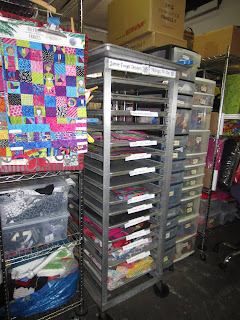 Each project I start gets its own bin, starting with inspirational bits to gathering fabric to sewn parts. They hold my thread, embroidery floss, needles, knitting, spinning and art supplies. I love them." 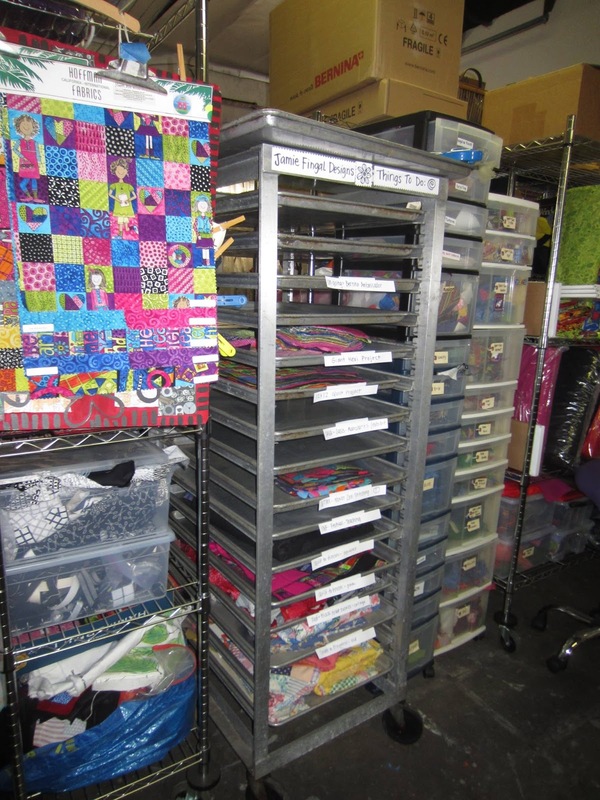 Celeste Akre agreed and said "I use art bins and use a label maker to label and DATE the start of a project. That way I know how long I have been working on something. Tutto makes a great bag that holds 3 skinny art bins or 1 thick one and 1 skinny. Great way to bring projects to retreat." Sarah Fielke said "Each project I start gets a project bag. All the fabric, sketches, threads and sometimes a block book goes in the bag. I would love to say there is then some sophisticated trick for keeping the bags organized but no can do. 😉 I do usually only have two or three quilts in production at the one time, and one is usually on the design wall." 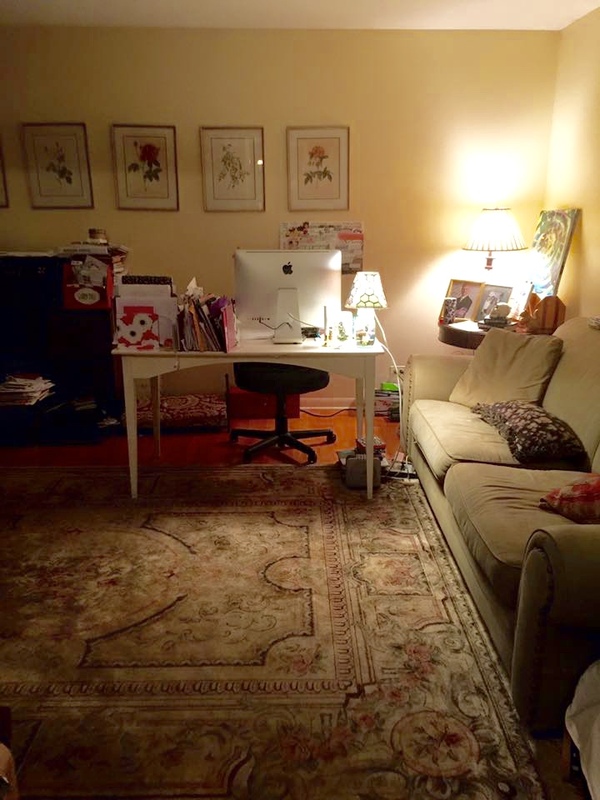 Jen Kingwell said "I use the IKEA kallax shelves. Each project gets its own cubby hole. I just pull out the container when I'm ready to work on it. Works well if I keep myself in check ( not my strong point)"
Rose Hughes said "I love Jamie's idea, but not having that space I have used archival poly bags purchased from Light Impressions -- they are large 20 x 22 and I made a rolling caddy that keeps things together. It works like a filing system. The bags can hold materials while project in progress, and I use the bags to store the quilt cartoon drawings once completed." Mandy Leins said "I recycle my free bags from all the shows to hold my projects, and have a hangtag on the outside reminding me what project is in each, and on the back of that tag is a list of the days I worked on it and what stage it's in. I cant stand to throw away those bags, and they hold a good-size amount of stuff, including a file folder and/or notebook. These are either hung from a hanger on a shelf or shoved under my longarm (the latter if it is something I'm feeling meh about). Also, if it's in a stage where it actually has some kind of photo, I'll put a Polaroid with the tag"
Lynn Harris responded to Mandy's comment, "I have a collection of quilting show project bags under my longarm too. I think this leads to my too much fabric problem. I don't want to "borrow" from a bag until the project is finished. Then the fabric can be filed back with the other fabrics. In the meantime I don't think of that fabric as mine because I can't use it in other projects yet." 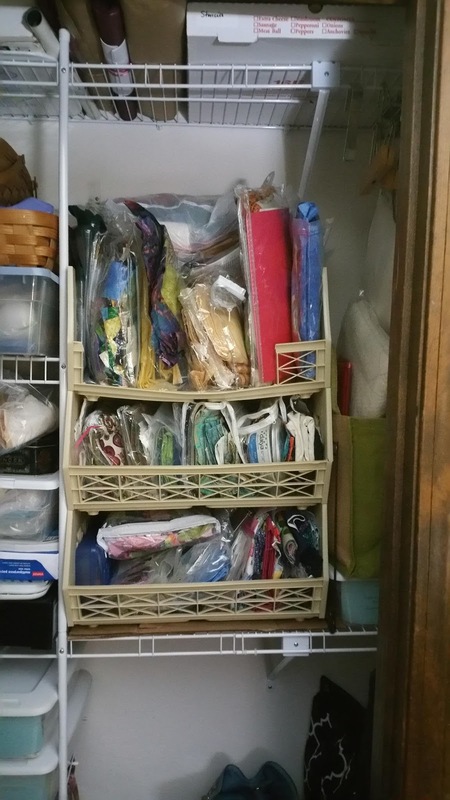 John Kubinec said "Plastic containers from the container store hold all the fabric and instructions. I label the container on all four sides so no matter which way it is turned I know what is in it. They fit easily on shelves and also stack easily." And Jenny Doan said "I use a flat white pizza style box. And write in the outside. They are thin and stack well." Carl Hensch and Maddy Kertay use Iris Scrapbook boxes. Since I already had a few of those, that is what I chose. Here is how they look in my studio. I found 6 quilt tops that just need to be quilted in with my fabric. I also had nine projects in some stage of process. That's a lot! Another thing I found were drawers from Target that work with my metal shelves! I decided to use it for my precuts. Because I get so much fabric from the fabric companies for use in the magazine, I can't store my fabric by color. I like to keep it together as a collection until I use it. So my fabrics are not sorted all pretty. 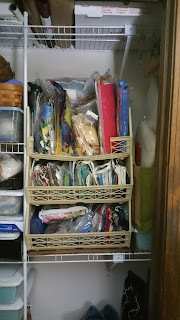 I got large bins to sort random things like T-shirts for a t-shirt quilt and random clothing for DIY projects. I marked them with labels and then decided that I did not need to look at them. So I put them in another room for storage. 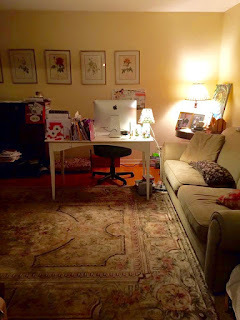 Next I decided I would put my daughters machine near mine so we can work at the same time if we like. I still have a bit of organization left to do, but I thought I would share my progress before I head to Spring Quilt Market in Salt Lake City Utah. 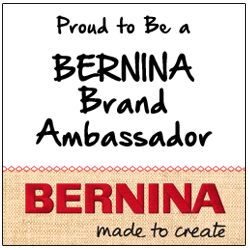 When I come back, I will have lots of products to share with you! See you soon!